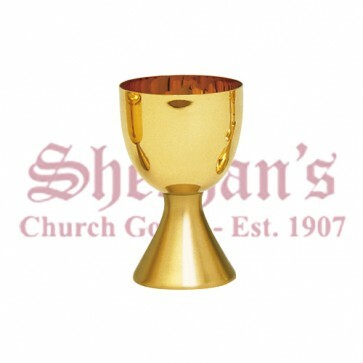 A chalice is a common type of drinking cup used in churches during the Eucharistic or Communion service. The chalice is meant to commemorate the cup used by Jesus during the Last Supper. The Large Capacity Chalice with Scale Paten features a gold plate finish and a large cup. The simple design is polished to a mirror finish and lacks any ornamentation. The stem is nearly non-existent in this design, with the cup resting directly on top of the base.